2014: Spotlight on Pam Swander! 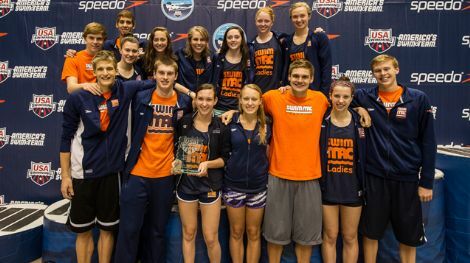 Pam is the North Region Manager and Head Coach SwimMAC Carolina. Previously she was the Assistant Head Coach for Women’s Swimming, at Indiana University where she helped direct the men’s program to the 2006 Big Ten Championship and the women’s program to three Big Ten Championships (2007, 2009, 2010) and three top-ten finishes at the NCAA championships (2008-2010). She also coordinated all aspects of recruiting at Indiana. Swander’s extensive coaching and leadership experience has earned her several positions within USA Swimming, including the Director of the USA Select Camp in 2006 and 2007, Vice Chair of Hospitality on the 2000 U.S. Olympic Trials Committee and the Indiana Swimming Delegate at the USA Swimming National Convention, among many others. Recently, she was inducted into the Delaware County (Muncie, Ind.) Athletic Hall of Fame for her achievements. Find out more about Pam online! Update: WICC 2014 Speaker Line-Up! 2014: Spotlight on Marcia Benjamin!